The flavor is of dried fruit with the spirits distinguishing themselves in layers gradually. In Fig-titious Fashion was inspired by the Muddled Old Fashion, although this cocktail has been a work in progress for some time. The figs were made on a whim as part of a creative experiment. St Remy XO happened by sheer luck after sampling the most delicious Brandy Sidecar cocktail at Johnny’s Italian Steakhouse locally the other evening. With the dark dried fruit and nut flavor of the brandy and the Old Fashioned cocktail still muddling through my brain, the Jim Beam Bourbon infused figs seemed a natural progression. 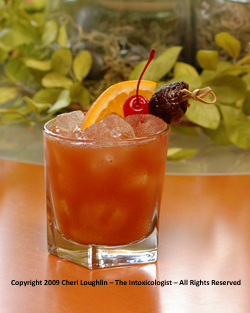 The juice of the orange plays freshly while fig and dark fruit rolls over the back of the tongue. Bourbon begins this nice slow dance across the palate in almost a devious sort of way that is unnoticeable at first and then it begins in full. Even the nut of the St Remy begins to shine. Since this isn’t quite an Old Fashioned, but based upon the formula it’s rather fictitious, don’t you think? Muddle orange slice, maraschino cherry, two Jim Beam Infused figs and bitters in the bottom of a mixing glass. Add Jim Beam Bourbon, St Remy XO and Jim Beam infused fig syrup. Add ice and shake well. Strain into an Old Fashioned glass filled half full of ice. Garnish with skewered orange slice, fig and maraschino cherry. Place figs in a glass container. Pour Jim Beam Bourbon over figs. Make sure the figs are completely covered. Add more Jim Beam if desired, since the figs will soak up some of the bourbon. Seal with lid and refrigerate. All the figs to soak up the bourbon for a few days before using. The bourbon will become syrupy and rich with fig and bourbon flavor.